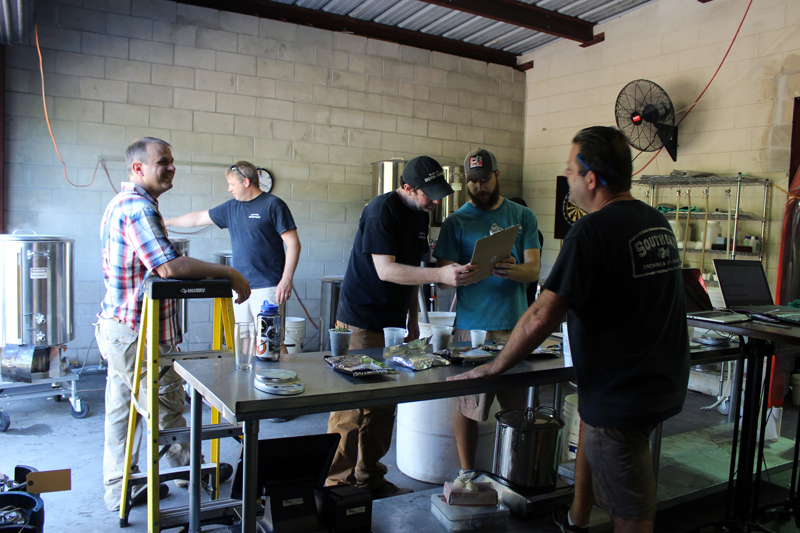 TAMPA, FL — Recently Southern Brewing & Winemaking (Southern) hosted a collaboration brew day in honor of the Bad A** Beerfest put on by Tampa Bay Brewing Company. Tampa Bay Brewing Company (TBBC) teamed up with Southern, Cigar City Brewpub, Barley Mow, Coppertail, Green Bench, and Big Storm to brew six recipes that will be released at the Bad A** Beerfest on June 28th. All six brews will be on tap together under one tent at the festival. The actual brewing took place at Southern on Friday, June 6th. Craft beer fans were invited to come hang out in the Southern biergarten and watch the brewing process. Southern was chosen as the brewday location due to the brewery’s unique small batch set-up that allows for six batches to be brewed at the same time. For the final brew, TBBC, CCB Brewpub, Barley Mow, Coppertail, Greenbench, Big Storm, and Southern all independently chose some malt and hops and threw them together for a unique and surprising amalgam brew. Southern was involved with all of brews that day, so one keg of each of the beers brewed for the festival will also be available on tap in the Southern taproom later this month. Tampa Bay Brewing Company (TBBC) of Ybor City will hold the first annual Bad A** Beerfest on June 28, 2014, on the site of their new brewery and restaurant in the Westchase area of Tampa, FL at 13937 Monroe’s Business Park. The craft beer festival is a celebration of the groundbreaking of the TBBC Westchase location and will showcase at least 20 local breweries, TBBC food, live music, and other entertainment. Proceeds of the event will benefit the Wounded Warriors of Tampa and South Florida. Located in Seminole Heights, Southern Brewing & Winemaking is a small, local craft brewery that makes and serves beers, ciders, meads, and sodas on site. The taproom has 24 taps and is located inside the conjoined homebrewing and winemaking supply shop. Southern Brewing & Winemaking brings in weekly food trucks and musicians, offers monthly classes on home brewing, and hosts events throughout the year in their newly redesigned biergarten.